The markets always go crazy when I am abroad. As I was telling Boris on the phone yesterday -- I should just buy volatility before I leave. I will be on the various networks talking about the U.S.’ downgrades today and tomorrow, so tune in when you can. I will also post videos if possible. 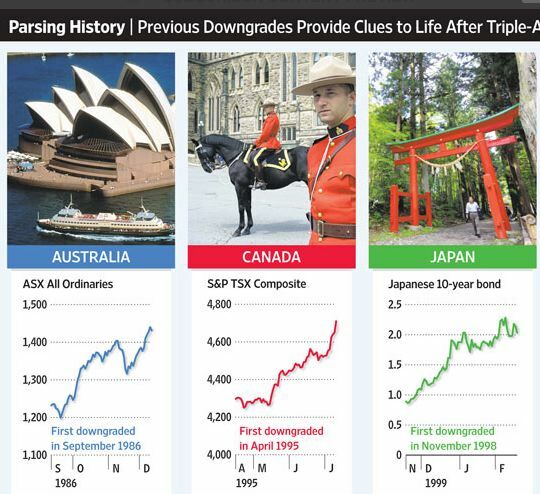 My good friend Tom Lauricella wrote an awesome piece in the Wall Street Journal about the Lessons from other Countries that have lost their AAA rating. In almost all cases, the initial impact was negative for the stock market and currency but as indicated by the image below, a rebound ensued shortly thereafter. However what makes history less reliable this time around is that Australia, Canada and Japan are not in the same league as the U.S. Will write more when I can but Asia always keeps me busy!